Market as I had won two places on the Complete Sourdough Workshop class which is held there. Having stayed overnight in London the night before (and enjoyed a delicious Lebanese meal at one of Maroush's many restaurants on the Edgware Road) we reached the market area early and had a few minutes to wander round and whet our appetites by browsing around all the wonderful food stalls, then headed into the school to meet our instructor, Manuel and his assistant Fran, and our fellow students, who ranged from experienced bakers to absolute novices. The day was well planned and thoroughly prepared for, so we accomplished lots and learned lots. The morning was spent learning about sourdough starters and starting to make our own, which we brought home to continue nurturing until it is ready to cook with, and then using some of the bakery's own starter to get our various bakes for the day started. 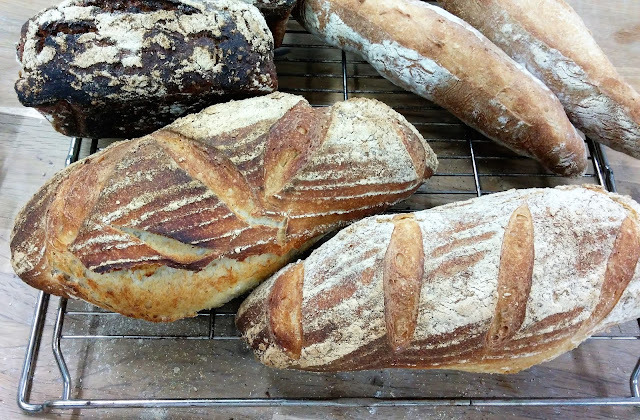 We were taught lots about the background of the breads we made and the techniques we were using and with the hands-on experience and expert tuition we learned far more than we could ever have done from books, television or You Tube. 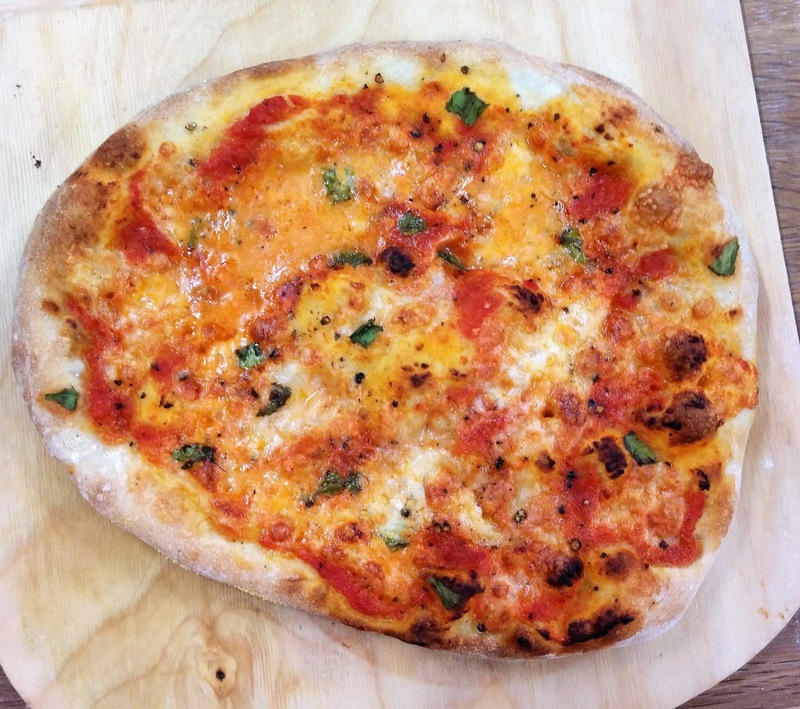 Our first completed make was also our lunch - a pizza made with a sourdough base. Probably the best pizza I've ever eaten - and the easiest I've ever made. We were even taught the shaping technique of slapping the dough from arm to arm. 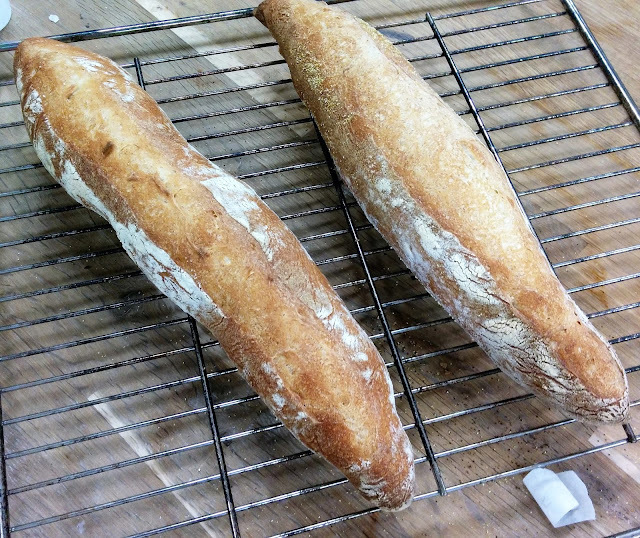 The same basic dough was used for our next completed bake, a baguette. This has the true baguette texture with a delicious crispy crust and lovely well risen crumb with large holes and a satisfying, slightly chewy texture. So much more like the baguettes we buy when we visit France than anything sold in local supermarkets! 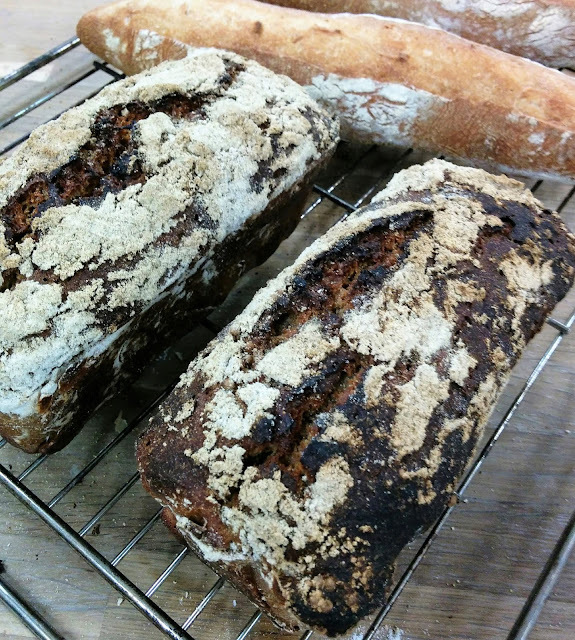 Next we produced a very dark rye bread called Borodinsky, which contains caraway and coriander seeds and has an unusual cracked-flour effect crust. As usual for a dark rye bread, this has a much denser texture and I can tell you, as I tried it today, is delicious with black cherry conserve for breakfast. 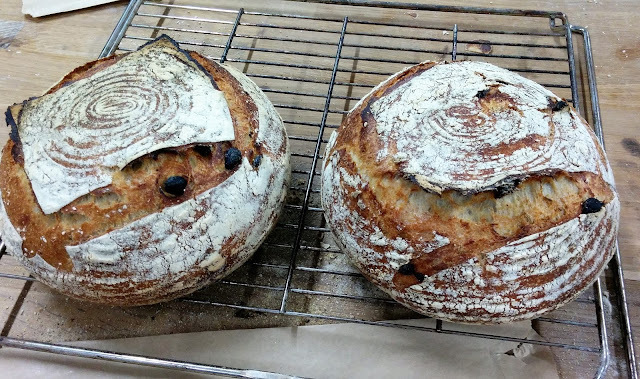 Next we made a Levain bread and were shown how to use a banneton to shape it and a razor blade to score the top - Mark and I made different designs. And our final bake to be completed - although due to the number of steps in the making, it had been the first we started, was a No-Knead Fennel and Raisin bread, which again we shaped in a banneton and scored with a razor blade before cooking in its own steam in a dutch oven. I think this is my favourite bread from the whole day. Apart from looking spectacular, the texture and flavour are wonderful. Fennel seeds and raisins aren't a combination I've ever thought of using but they are delicious together. We've just eaten some of this with cheese for lunch. 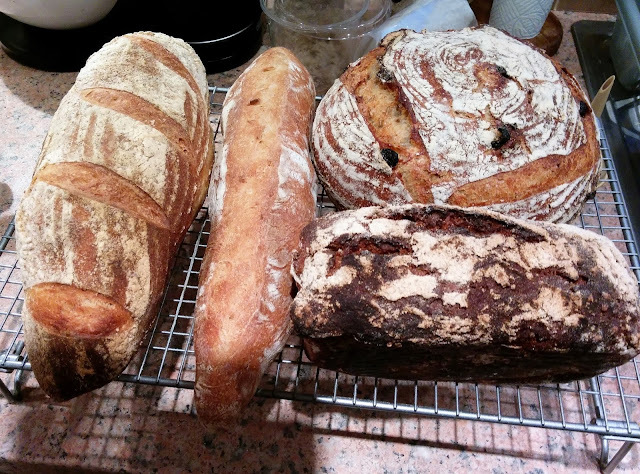 So we staggered back to the station under the weight of four delicious loaves each - we've had to put some of it in the freezer as there is far too much for the two of us to eat before it goes stale - plus our recipe packs, our own sourdough starters, bags of rye flour and highly useful scraping tools. As you can imagine, the smell of freshly baked bread filled the whole carriage on the train. 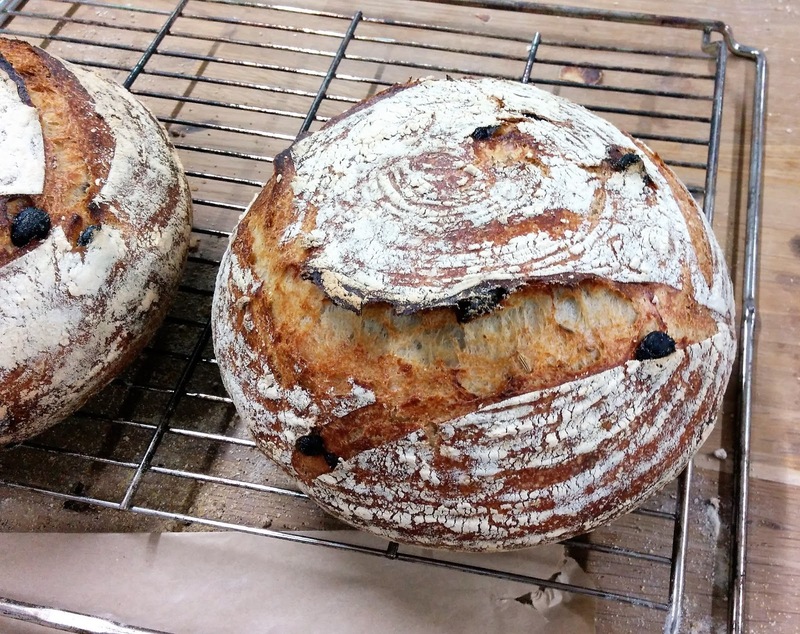 We keep looking at our breads and thinking "Did we really make those?" - so much flavour and so much variety packed into six fascinating hours. If you would like to read about Mark's take on the day, and see his photos, you can read his own blog post here. Wow! You have been busy Jane, your pizza looks fabulous - I bet your house smells nice with all of that fresh bread. Amazing prize for you and your hubby! But it would have been my worst nightmare LOL! Now if it had been all about puddings that would have been a different matter. Thanks for sharing your day with us - makes a very interesting read. Fabulous prize, the pizza looks delish!!! as to the rest of the breads. I made a pizza last night, first one in years. What a wonderful experience. Have a great day.